Khaman Dhokla is a traditional Gujrati snack and can also be served as a n appetizer. It is a steamed savoury cake made with besan/chickpea flour topped with a mild seasoning. I would also call this as a nutritious guilt-free snack since it is steamed and not deep-fried. There are umpteen number of ways to prepare dhola and I made this folowing Srivalli's recipe for the Indian Cooking Challenge. Am really happy to be a part of this challenging event. Since I would have never ventured to make dhoklas if not for this event. Also, do check out our previous trial challenge-rava laddoos! I followed the recipe exactly as given by Valli, I skipped the coconut garnish since I did not have them at home. Mix the curd and water. To this add the besan and mix well. The consistency of the batter should be like idly batter. Add the cooking soda and keep it aside to rise for 1 hour. If you are using a pressure cooker, fill the pan with water, place a plate over which you will have use a plate for steaming the dhoklas. To the batter mix in the lemon juice, oil, salt, sugar, chopped green chilies and turmeric powder and mix well. This has to be done just before pouring to the plate. Meanwhile when the water reaches the rolling stage in the pressure cooker/kadai, mix the eno to the batter (Save little of eno for dusting on the plate). Bubbles wil start coming out. Dust or sprinkle the plate with eno. Then immediately pour the batter to the plate. Place the plate carefully inside the pressure pan and cover with lid. Do not use the whistle. After covering you will find steam coming out of the outlet, simmer and don't disturb for almost 5 -7 minutes. Check with a fork if it is well cooked. Close with a lid and allow it to stand for a minute. In a bowl, mix 3 teaspoons of water along with 1 teaspoon of oil. Pour the water and oil mix over the top. For seasoning, heat a pan with oil, add curry leaves, sesame seeds, mustard seeds and finely chopped green chilies. Once they start spluttering, remove the seasoning from the stove and pour it on top of the dhokla. The batter should be filled to only 1/2 as it will rise up. After adding eno the batter should not rest. Amount of sugar can be increased on preference. Slice and serve with some green chutney! Sending this Steamed Treats hosted by Shrutei. This is a tangy, mouthwatering authentic tamil recipe with the purple vegetable, brinjal. Even people who disike brinjal tend to adore this dish. It goes well with rice or rotis. It is made with roasted aromatic spices and fresh brinjals blended together in oil. This recipe was passed on to me from my dear mom! Small eggplants taste best when using this rcipe, however if using the long ones, slice them into two halves before stuffing. In a small pan, add a teaspoon of oil and roast the coriander seeds, cumin seeds, urad dal, channa dal, peppercorns, red chillies, sesame seeds and asafoetida together on low heat. Take care they do not burn. Allow them to cool and grind them together along with the roasted peanuts,salt and the grated coconut. Wash the brinjals and slice the stem at the top. Then make two perpendicular slits from the top. The slit should be made 3/4 th way and not till the bottom. Now stuff the ground masala, inside the slit brinjals and leave them aside for about 15 minutes. Heat a pan with a little oil and season with cumin seeds, mustard seeds and curry leaves. Add the stuffed brinjals and also add the tamarind paste and a few tablespoons of water. Cover and allow it to cook until the brinjals soften. Then remove the lid and simmer for about 3 to 4 minutes, until the oil comes out from the sides. Adjust salt. 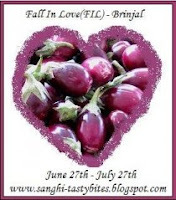 Sending this to FIL:Brinjals hosted by Sanghi. Also sending my other eggplant dishes. Tofu was something which I stayed away from because of its bland taste. But once I got to know about its nutritional benefits, I wanted to somehow sneak it in into our normal menu. So I tried making this flavorful tofu parathas, which are spiced up with some pickle masala. I happened to see this recipe in Show Me The Curry Site. It really is delicious and is a great varaition from the normal rotis and parathas. Silken tofu is used because it just blends with the flour, but if you use the firm tofu kind, it has some crumbly texture, so you can actually feel the tofu in each bite. It works well too. In a large mixing bowl, just mash the tofu with your fingers or a fork. Add the ingredients - cumin powder, chilli powder, asafoetida, green chillies,cilantro, pickle masala, oil and salt and mix everything together. Slowly add the chapathi flour little by little and knead until you get a smooth dough. Cover and rest the dough for about half an hour. Make lemon sized balls and knead it into circles. Cook them on a hot tawa/iron skillet, until both sides get completely cooked. Drizzle some oil while cooking. Serve with any vegetable or yoghurt or pickle. I served it with some yoghurt pachadi. This is another recipe I tried from Alisa's blog for Tried and Tasted. It came out perfect. The streusel on top came out crispy and crumbly and the apple base was soft and melted in the mouth. I will definitely be trying this recipe with other fruits. I halved Alisa's recipe since I had only two apples. It makes a great dessert and I guess it should taste great with some vanilla icecream. In a mixing bowl, mix together the oats, flour, brown sugar, nutmeg and half teaspoon of cinnamon. Add the margarine and combine with a fork to get a coarse mixture. Slice the apples thinly and mix them along with 1/2 teaspoon of cinnamon left and arrange the apple slices evenly on the baking dish. Top the apple slices evenly with the oats-flour mixture, so as to cover all the apples. Drizzle with the maple syrup. This helps to seal the streusel topping with the apples. Bake for about 30 to 35 minutes, until the topping turns crisp. immediately caught my attention. I had a huge watermelon at home, after stuffing ourselves with the melon, we had a little leftover. I made this simple yet refreshing drink perfect for a hot summer day!! Before heading over to the recipe, I ask you to go and check out Alisa's recipes. She has an amazing blog and has also released her own cookbook. Her recipes are mostly vegan, dairy-free, egg-free, nut-free, soy-free! I have also tried a few more recipes from her blog! They will be posted here soon! Seedless watermelon chunks - about 6 ounces. I used about 2 cups of watermelon cubes. In a blender add together, the watermelon chunks, lemon juice, honey/agave nectar, cold water and pulse until smooth. Fill two large glasses with the lemonade and icecubes. It is that simple! Simple yet exotic! Also do check out my Watermelon-Yoghurt Icecream! I should say these are the best cookies I have ever made!! Inspired by her post, I was immediately craving for some cookies! I made a huge batch of these and it was over in no time!! I adopted the recipe from the Betty Crocker website. It is packed with peanut butter taste and just melts in the mouth! I followed the exact recipe and it turned out great. In a large bowl, combine together the granulated sugar, brown sugar, peanut butter, butter, shortening, egg and mix well. In another bowl, combine the flour, baking soda, salt and baking powder. Slowly add the flour mixture to the first prepared mixture and knead slowly to form a dough. The recipe called for refrigerating the dough after kneading. I shaped the cookies into small balls of about 1 inch thick and arranged them on a baking sheet lined with parchment paper. Slightly press the cookies with a fork to flatten it out slightly and also to make a small line pattern on the top. I later refrigerated the cookies along with the baking sheet for about an hour. This process helps the dough to become firm and helps the cookies to retain its shape. Preheat an oven to 375 degree Fahrenheit. Place the cookie sheet in the middle rack and bake for about 9 to 10 minutes until golden brown. When you remove the cookies from the oven they might still be soft. Once they cool, they turn crunchy. Also check out my Peanut Butter Banana Smoothie! Ven Pongal is a typical tamil breakfast. It is a part of the menu in almost all south-indian restaurants. it is made with rice and lentils so it keeps you full until lunch. It is a combination of rice and split moong dal seasoned with whole peppercorns, cumin seeds, andcashews roasted in ghee. It is usually accompanied with sambar and coconut chutney or with gothsu. Go easy on the ghee since it is the exotic ingredient which adds more flavor to the dish! Cook the rice and dal together with water and salt in a pressure or rice cooker until well cooked. Add warm milk if using and mash well. The consistency should be mushy. In a seperate pan do the seasoning with ghee or oil with the cumin seeds, ginger, curry leaves, peppercorns and cashews. Take care because the peppercorns splutter while doing the tempering. Pour the seasoning over the rice and mix well. Serve hot with sambar and coconut chutney ! Sending this to WYF:Breakfast hosted by EC. After the edition of Show Me your Breakfast! , I am here with another interesting event. Thanks to everyone who made "Show Me Your Breakfast" a huge success. Will be back soon with the roundup and also a small surprise!! Sandwiches in all forms are comfortable, adaptable and practical! They can be dressed up with the finest toppings ranging from vegetables, cheese etc to the simple butter and jam. And they are all exotic in their own ways. 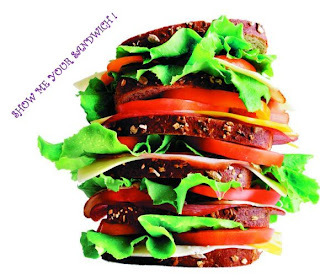 A well-designed sandwich can contain all the required food groups. It can be packed with all nutrients and can make a complete meal by itself. There are umpteen number of possiblilties to make a sandwich. So put on your thinking caps and come out with your signature sandwiches!! Make your own signature sandwich! It can be made with anything edible! It can me made of any type of bread. Flatbreads like pita, tortillas, chapthis can also be used. The filling can be anything hot or sweet, vegetables, meat and anything you can think of!! Blog about your sandwich anytime between now and August 10th. Older posts are not accepted. Please link back to this announcement and feel free to use the logo. UPDATE:You can send in any number of entries!! Last date for sending in your entries is August 10th. Looking forward to all your sandwiches!! Eating a wholesome, hearty and balanced breakfast is a great and fantastic way to start the day!! There ae so many delicious and nourishing ways to fix up a breakfast. If you are looking for some new ways to spice up your morning breakfast routine, stay tuned in for the roundup of of the 'Show me your breakfast' coming up! Tomorrow is the last day for sending in your entries! Protein and monounsaturated fat from the peanut butter, potassium from the banana, and protein and calcium from the milk will get your day off to a great start! This is a simple and great way to indulge as well. Just throw in all the ingredients in a blender and you are good to go. It keeps you full for hours as well. Chop the banana roughly, add everything in a blender and pulse until smooth. This smoothie is versatile. You can make your own variations to it. You can sweeten it with maple syrup or honey. You can add a pinch of cardamom powder, cocoa powder or vanilla essence for more flavor. You can add a few ice cubes and have it chilled! Food For 7 stages of life:Kids initially started by Radhika and to FIL:Fruits. Pesarattu is a typical breakfast of Andhra Pradesh. It is a great and healthy way to start your day since it is packed with carbs and protein. it also keeps you full for long. It can be made along with onions sprinkled on top and served with coconut, ginger or any type of chutney. Am sending this to Show Me Your Breakfast event being hosted in my blog! Soak the moong dal/green gram in water overnight or about 6 to 7 hours. In the morning, drain the water and add all the other ingredients to the dal and blend in a mixer to form a smooth batter. The batter should not be too runny or thin. It should be in idly/dosa batter consistency. Heat a tawa and add a little oil and spread with a half cut onion. Once the pan turns hot, pour a ladle of batter in the middle and spread in a clockwise/anticlockwise motion in circles, starting from the center to the corners of the pan. You can add chopped onions on top if you like. Drizzle some oil on the corners. After about a minute, flip the pesarattu with the help of a flat spoon. Cook for one more minute. Serve with yoghurt/curd and any chutney of your choice. This is part of "Show Me Your Breakfast" event being hosted in my blog. Send me your entries before July 10th!! Out of chutney ideas?? here are a few of them. Do check them out! Also sending this to EFM:Breakfast Series and also to MLLA-13 conceived by Susan of the Well-Seasoned Cook and currently being hosted by Sunshinemom of Tongue Ticklers and also to WYF:Breakfast hosted by EC. I cannot believe half the year is already over!! And yeah, it is the beginning of a new month and time for Sweet and Simple Bakes! The choice for the month is Chocolate orange Drizzle Loaf Cake. One evening, I was craving cake and was looking for simple and refreshing cake recipes. I stumbled upon this recipe but I did not have oranges at hand. In our new apartment we have an orange tree, but we have never tried those oranges. So I just ran outside a grabbed a few oranges and immediately set to try this delicious cake. I had some dark chocolate and I thought it would be too overpowering to do the entire frosting with it. So I just melted the chocolate and drizzled it over the cake. the cake was moist due to the addition of orange juice and it had a hint of citrus flavor in every bite! Line and grease a900g (2 lb) loaf tin. I melted 2 blocks the dark chocolate in the microwave for about 2 minutes. Drizzle it directly over the cooled cake. leave the cake for a while for the chocolate to set. Check out my other cake recipes..